The Extreme 7-Minute Solutions II(4-Program Compilation)DVD Feature lively graphics and a pulse-quickening soundtrack and Include real-world insight from seasoned drivers and safety professionals. Videos cover the most intense, emotionally charged, and dangerous situations your drivers can face on the road. At the Scene! Shows drivers the hows and whys of staying calm while coping with a crash. It explains what to do in the first few minutes after an incident ... valuable guidance your drivers can use to keep a bad situation from getting a whole lot worse. Road Rage! Defines the problem of road rage, explains how it affects professional drivers, and covers what your drivers can do to prevent becoming victims of -or contributors to - road rage. Road Work! Shows drivers how to manage their vehicles in and around road construction areas. Also focuses on the necessary precautions that should be taken in work zones, and the special hazards to look for. Traffic! 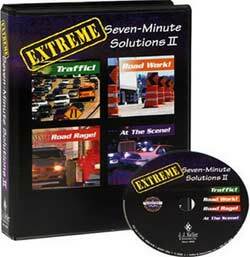 Explores the challenges associated with ever-increasing traffic and demonstrates techniques for avoiding traffic-related accidents (even on the most jam-packed roadways). It provides valuable tips for driving in congested areas.